In June 2017, the 11 story Kwong Loong Tai Building at 1016-1018 Tai Nam Street in Cheung Sha Wan was put in the market with estimated value of over HK$1.2 billion thanks to the soaring real estate price and the keen interest from developers for re-development. Built in 1961, the building had survived three major fires in its first two decades – 1964, 1972 and 1981 with the last one being was one of the most serious industrial fires in HK history resulting in over HK$100 million in damages with special TV news reports interrupting regular broadcast at the time. The building was developed by Kwong Loong Tai Co Ltd, which dominated the raincoat industry in the 1950s and 1960s and along with its sister company Kwong Hing Tai Garment Factory whose shirt output represented one-fifth of the colony’s shirt production in 1955, were major players in the HK garment industry. Kwong Hing Tai and Kwong Loong Tai were founded before the War in the 1930s by the Tse brothers, natives of Hoi Ping in Guangdong province. The eldest of the brothers – Tse Yee-chee (謝汝池) was the chairman of the group while the younger brother Tse Lai-sang (謝麗生, who was director of CMA) and Tse Yee-hung (謝汝雄) ran Kwong Hing Tai and Kwong Loong Tai respectively. 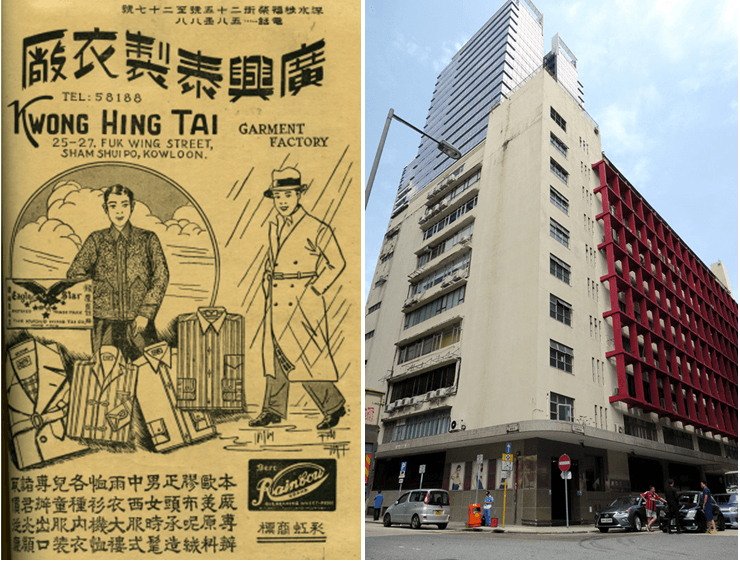 Kwong Hing Tai, which was initially located at 25-31 Fuk Wing Street, focused on shirts, manufacturing brands such as “Joyful Occasions” (喜事恤) and “Dinosaur” (恐龍恤) which were popular in Southeast Asia. Kwong Loong Tai, which was initially based out of 32 Lower Lascar Row in HK island, specialized in raincoats and overcoats under the Goose” “Snow Drift” “Eagle Star” “Sea Maw” “King Dragon” brands. By 1952, Kwong Hing Tai had the largest number of sewing machines (150) amongst all garment manufacturers with 180 workers and daily production of 100 dozens pieces of garment. Business that year was down 30% from the previous year with Indonesia and Thailand being the top two markets. By 1956, a year after its incorporation, business had grown significantly and the number of workers expanded to 700-800 and daily production also grown to 700 dozens pieces of garment. In May 1956, Kwong Hing Tai moved into a new 6 story building at 1033 Yee Kuk Street, Sham Shui Po and with the new state of the art machines and new building, production capacity doubled. At the meantime, Kwong Loong Ti also prospered under the management of Tse Yee-hung and had workforce of over 500 by 1958 (which he took on a tour of Shatin that year) and moved into bigger space at 94-98 Larch Street in Tai Kok Tsui in Kowloon in September 1957, the same year it was incorporated with HK$1 million in capital. Aside from Southeast Asia, the two firms also exported to the UK, Africa, Middle East and Central and South America. In 1961, Kwong Hing Tai and Kwong Loong Tai decided to consolidate its production at the new Kwong Loong Tai Building on Tai Nam Street, moving 1800 machines worth close to HK$3 million into one building which they developed at the cost of $1.5 million. The new building represented over 160,000 sq ft and an entire street block, making it one of the largest industrial building in HK at the time. 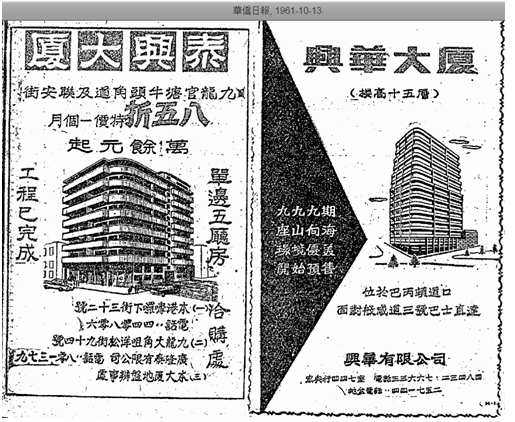 The firm also built the 8 story Tai Hing Building in Kwun Tong the same year. 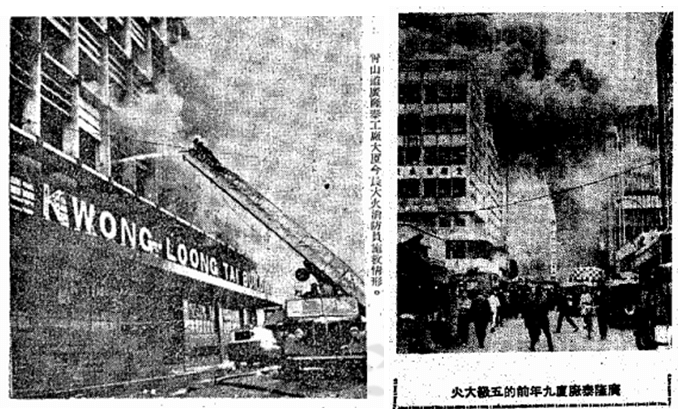 Sadly, the Kwong Loong Tai building was touched by fire multiple times in its history. The fire which took place in July 1964 affected 3000 workers and the building was temporarily taken over by the Fire Department but managed to re-open in August 5. Fire took place again in 1968 and 1972 (that one resulted in $50 million in damages and 2 were injured), but the one on November 6, 1981 was the most severe, burning for over 12 hours although the building structure remained intact. Y.C. Tse was particularly close to the senior management of Hang Seng Bank, having hosted a special reception for Ho Tim when he was elected chairman of the HK Gold & Silver Exchange in 1956 and also served as vice chairman of Hoi Ping Chamber of Commerce (旅港開平商會) in 1965 when QW Lee of Hang Seng Bank was chairman. By 1991, Kwong Hing Tai was operating out of Hop Hing Industrial Building in 702 Castle Peak Road and its directors included Robert Tse Wai-kit (謝偉傑), Terry Tse and David Tse while Kwong Loong Tai was still at the Tai Nam Street site with Francis Tse as general manager. Both listed 200-499 for number of employees. Kwong Hing Tai is still live company but dropped Garment from its name in 1981 while Kwong Loong Tai was dissolved in 2011. This article was first posted on 9th April 2018.